Quickly after arriving in Lhasa, Tibet, I fell in love with the place. The more I travel, the more I seek out places that are truly foreign. I seek experiences that just don’t make sense. 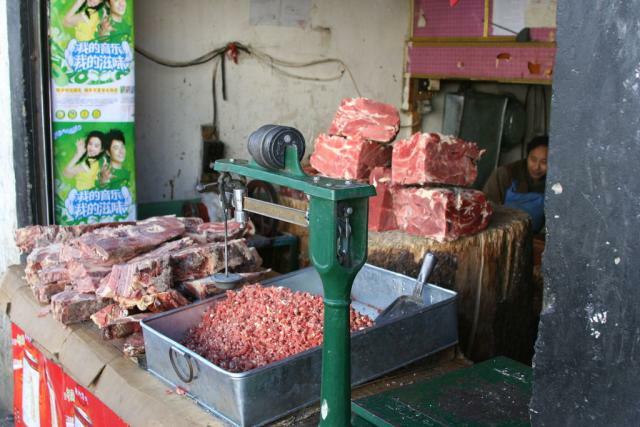 These types of experiences abound in Lhasa. As you wind your way down the alleys, you’ll eventually reach Barkhor Square, the heart of the old city. 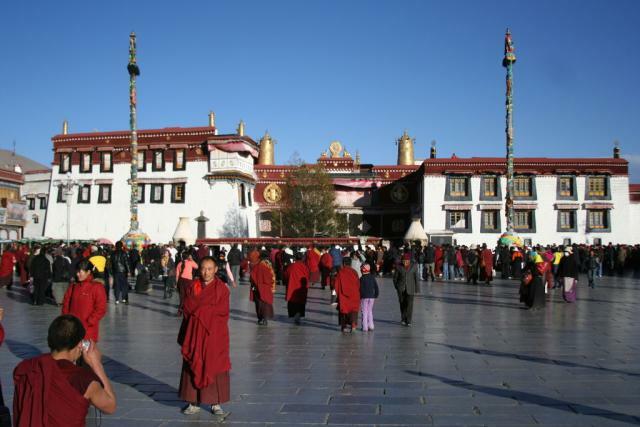 The centerpiece of the square is Jokhang Temple, the holiest site for Tibetan Buddhists. The Jokhang Temple was built in 642 (yep, that’s 1,365 years ago!) to house the Jowo Shakyamuni Buddha, a gold Buddha statue brought to Tibet by a Nepali princess who married the then-king of Tibet and basically started Tibetan Buddhism. The statue has become the most venerated object for Tibetans. Many Tibetans make a pilgrimage to Lhasa at least once in their lifetime just to visit the Jokhang Temple and its Jowo Buddha. Of course, they can’t just hop on I-65 and arrive in Lhasa in a few hours. The journey, through harsh terrain, can take weeks or even months. Some of the most reverent Tibetans travel by way of prostration, where they place their hands together, touch their foreheads, chest and stomach and then slide across the ground making sure to touch their forehead to the ground (resulting, in some cases, in wounds on their forehead). After the slide is complete, they get up, walk 2 or 3 steps to the spot where their hands ended up after the slide and then repeat. As you can imagine, this is not a very fast mode of travel. 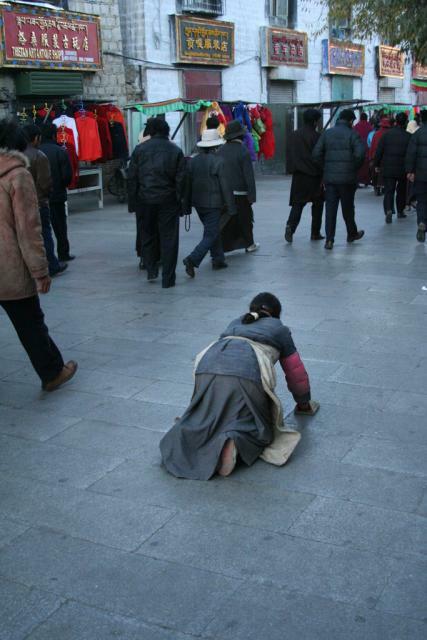 I’ve read that some Tibetans have spent years traveling between holy sites in Tibet by way of prostration. When we first approached Barkhor Square and the Jokhang Temple, we were swept up in the “kora” of the Jokhang Temple. The kora is a route traveling in a clockwise direction around the temple. From dawn to late in the night, you can see many Tibetans traveling this route either by walking or by way of prostration in hopes of earning merit as a Buddhist. Many of the Tibetans are holding a prayer wheel which is basically a stick with a wheel on the end, which houses prayers written in Tibetan script. As the wheel is moved in a clockwise direction, the prayers are released up to heaven. 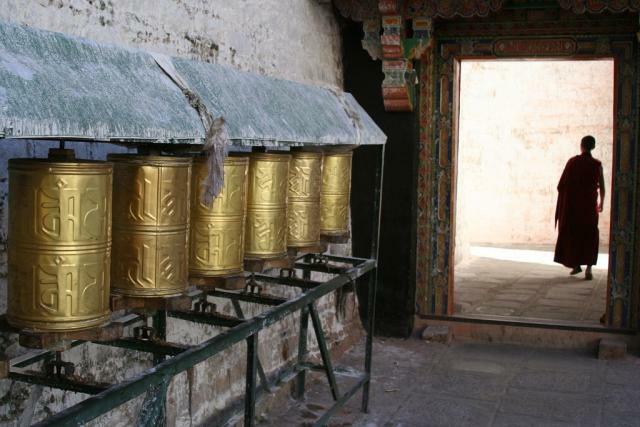 Similar prayer wheels line the sides of building and temples, allowing you to turn the prayer wheels as you walk by. The line to visit the Jokhang Temple was extraordinarily long. After waiting for a few minutes, a few of the pilgrims tried to explain to us in Tibetan that we foreigners (who were going to pay a sizeable entrance fee) weren’t required to wait in the line. After some hand gestures, we finally figured out the protocol and made our way to the main entrance. The temple was quite dark inside, relying on yak butter candles to provide most of the lighting. Instead of doing a quick tour of the temple, we decided to jump back in line with the pilgrims who were slowly visiting the many side chapels that housed multiple statues of Buddha and other gods. The devotion and reverence of the pilgrims was extraordinary. They took their turns touching their forehead to the altars, leaving small sums of money in front of the statues and refilling the candles with a fresh batch of yak butter (which has a distinct smell that I won’t soon miss). Unlike most of the temples, mosques and churches I’ve visited throughout the world that seem more museum than place of worship, this place was alive. After the Cultural Revolution in China that prohibited religion in Tibet for several years, you got a sense that the pilgrims to the temple wanted to get in all the worshipping they could just in case they are prohibited from doing so once again. We left the temple emotionally exhausted (and physically sore after enduring the endless pushing of the pilgrims as we made our way through the temple).